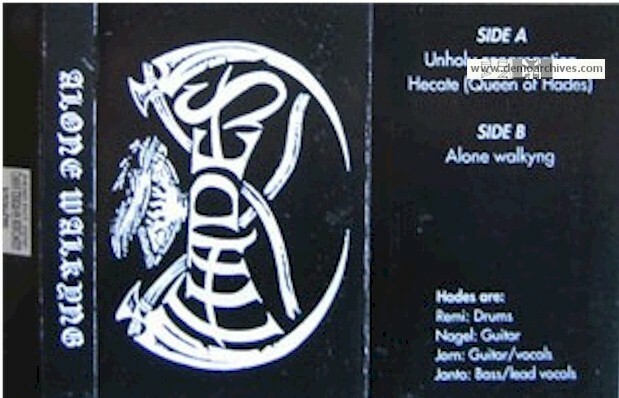 Hades was formed in 1992 by Jörn of Immortal because he wanted to create a music style that was both filled with melancholy and atmosphere to please his lust of memories of old Bergen (Bjorgvin) and old lands of mysteries and folklore. The line up was completed by Janto (bass and vocals), Nagel (guitar) and Remi (drums). 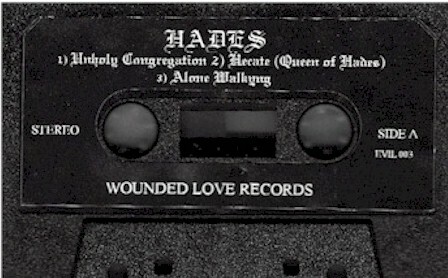 In 1993, Hades recorded their first demo "Alone Walkyng" in Grieghallen studios (Bergen). 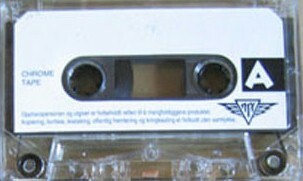 There was great response and Wounded Love released it on their label as cassette and as a mini-CD. Hades were forced to change the name to Hades Almighty after the American band of the same name reformed. Pro printed cover with lyrics. I've seen white and black tapes with a decent looking sticker. 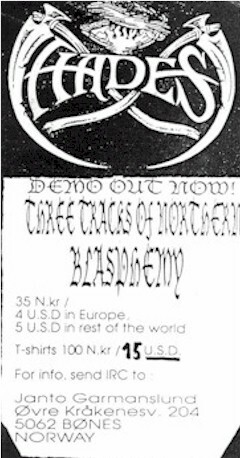 The scan below shows the Wounded Love Records pressing of the demo. Printed on thicker than usual paper with lyrics. The scan below is the original pressing of the demo!